Butter is packaged in sticks, blocks, tubs, and pats. We know what the first three are, but how much is a pat of butter? A block of butter weighs about one pound, and a stick is a fourth of a pound. Tubs vary in weight and size. One pat of butter can also vary in size and packaging. Butter packaging material can be foil, waxed paper inside a cardboard box, or plastic and cardboard tubs for multiple servings. A single-serving, or 1 pat of butter, is most often found these days in a tiny plastic tub with a foil lid. It can also be packaged in a small foil-wrapped square. Why Do We Love Butter? What Is A Pat of Butter? Why Is It Called A Pat Of Butter? How many pats of butter are in a tablespoon? How many pats of butter are in a stick? How many calories are in a pat of butter? Pat of butter or pad of butter? The Irish poet Seamus Heaney lovingly called butter “coagulated sunlight.” American celebrity chef Paula Deen is famous for her liberal use of butter. In 2009, at the State Fair of Texas, deep fried butter was introduced and won the prize for “Most Creative” food. What is it about butter that makes us love it so much? Butter makes everything taste better! Butter adds depth to the flavor of just about anything. It’s also a comfort food – the rich taste and creamy texture are comforting and lift our spirits. Whether it’s an ingredient in a recipe or spread on bread, it tastes divine. Butter has been popular from Scandinavia to India since ancient times, when it was first discovered that cows could be milked. It caught on much later in Europe, during the Middle Ages, and was initially only consumed by peasants. The nobility didn’t eat butter until the Catholic Church declared it the only animal fat allowed on the days when meat was forbidden. As the middle class grew, they continued eating butter. If a little is good, a lot must be better. The English became famous for dishes of meat and vegetables swimming in butter. The rest of Europe used butter in pastries and sauces. As Europeans migrated to the United States and other countries, they took this butter knowledge with them. There are many varieties of butter. The differences in butter are caused by the type of cows that provided the milk, what the cows have been eating, and how long the milk or butter were stored before it was sold. Butter is a favorite ingredient in baking and cooking. It is used as a spread on many types of bread. Butter is also used to prepare pans for baking or melted in a skillet for frying. Adding browned butter to a recipe will give a rich flavor to the final product. Butter is not good for frying at high temperatures unless it has been clarified first. 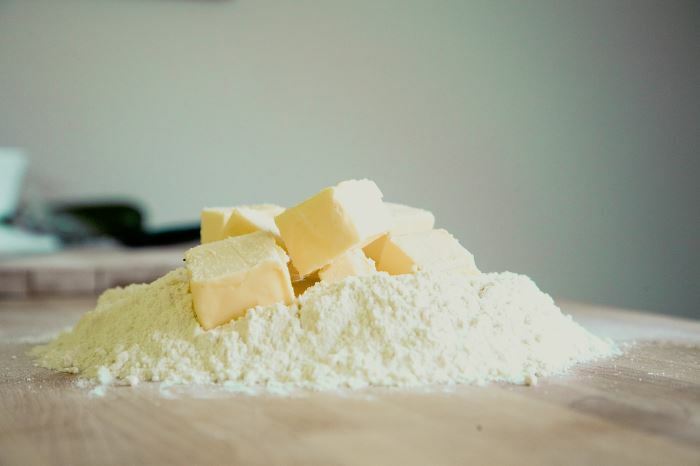 By bringing the butter to a boil and allowing it to cook until the milk solids are browned and then discarded, the smoke point of butter can be raised. This clarified butter (or ghee) can then be used for frying at higher temperatures. Larger packages, like sticks and blocks, are good to have around if you do a lot of baking. Butter can be stored for a long time and will not go bad. But if you want to limit your butter intake or just have it in prepackaged servings, a pat of butter will do the trick. What is a pat of butter? A pat of butter is just enough for a warm biscuit. One pat of butter, melting on a warm slice of homemade bread is heaven. A pat of butter is a single-serving of butter. It can be shaped as a square, as an ornamental curl, molded into flowers with candy molds, or can be a dollop in a tiny tub. Why is it called a pat of butter? The name originated with the practice in fine hotels and restaurants of patting butter into small ornamental molds. The resulting butter pieces were named “pats” and the term stuck. These small pats could be chilled on small plates and served quickly, as needed. There is a question of how many pats of butter are in a tablespoon. One ounce of butter equals about two tablespoons. However, the size of what we call 1 pat of butter can vary according to packaging. The most common pat of butter, the square, contains about half a tablespoon. Smaller pats, often the tiny tubs, are about 1/3 tablespoon. Depending on the package size, there can be 1 to 3 pats of butter in a tablespoon. Another question is about how many pats of butter are in a stick. If you are just slicing a quarter-pound stick into even one-tablespoon pats, you will have 12 pats. Results will vary if you are softening the butter first and making shapes with candy molds. Smaller molds will yield more shaped pats of butter. Butter is delicious and makes everything better, but how many calories are in a pat of butter? 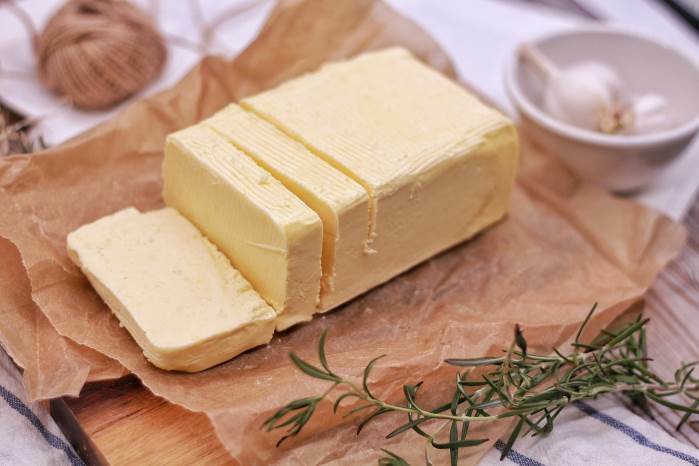 A one-tablespoon pat of butter contains 100 calories, 11 grams of fat, and 7 grams of saturated fat. A one-teaspoon pat of butter can contain 36 calories. A half-tablespoon pat can contain 50 calories. Butter is one thing we can all appreciate, but in moderation. Because it can be so rich and creamy, we don’t need to eat a lot in order to enjoy it. Is it a pat of butter or a pad of butter? They sound similar, but are not the same. A butter pad is a small plate used for serving pats of butter. I’ve also need sticky notepads shaped like a stick of butter and called “pad of butter.” Only “pat of butter” refers to food. What is the difference between a pat of butter and a knob of butter? A pat of butter is generally served as a condiment and is less than one tablespoon. A knob of butter is an arbitrary amount and is used in cooking. It is generally accepted that a knob of butter is the amount needed to cover the bottom of whatever size pan or skillet when melted. A knob is often cut off of the end of a stick without measuring it. Some people say that a knob is about the size of a thumb, but those also vary from person to person. There is more to butter than just how much is a pat of butter? Every bite of butter tells a story of grass and sunlight. It’s a story of family and traditions. Butter has been used as an everyday food and for special occasions for centuries. Butter can stir up memories of people and places. It can be the final touch in a chef’s masterpiece, or it can be a simple addition to a sandwich for lunch. How much is in a pat of butter? It depends on what you’re measuring.